As part of my drive to eat more healthily, I’ve been trying to make the most of the things I grow in the garden. 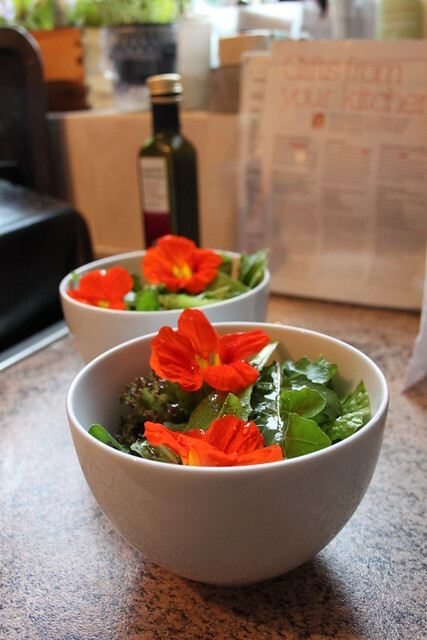 Here’s a salad I made from salad leaves and nasturtium flowers, dressed simply with olive oil, balsamic vinegar and a little freshly ground black pepper. Just as quick to make as cheese on toast – and much more healthy. This entry was posted in Food, Gardening, Photo of the week and tagged Food, Gardening, Growing, Nasturtium, Photo of the week, Salad by Simon Perks. Bookmark the permalink.